Now that I don’t flat-out reject salads, I have begun looking around for interesting salad dressings that fit in with my salad principles. This is one I found that I have been quite pleased with, and it makes a decent amount of dressing. I can safely say it makes enough for two large dinner salads (well, large for the two of us, anyhow) and a few individual lunch salads to boot. It only really thickened up after some time in the fridge, but kept nicely. 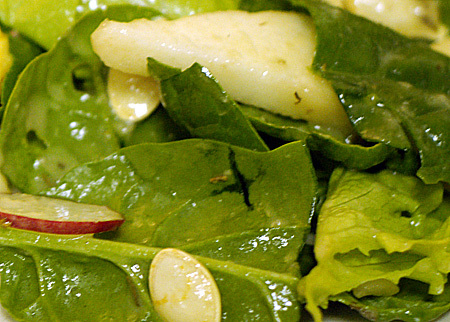 To make the vinaigrette, peel the pear, cut it into quarters and remove the core. Place the pear pieces in a small pot with the wine. Cook over medium heat, turning the pear pieces to ensure even cooking, until the wine has mostly evaporated and the pear is quite soft. Transfer to a food processor. Add the garlic, mustard, vinegar, thyme, sugar, salt, and pepper and blend thoroughly. While blending, drizzle in the olive oil slowly until you achieve a thick, emulsified dressing. Taste and adjust seasoning before dressing salad. 1. Mix of romaine and baby spinach, toasted walnuts, red onion, gorgonzola, and pomegranate arils. 2. Romaine hearts, pom arils, and sugared walnuts. 3. Mixed baby greens, almond praline, pom arils, goat cheese. 4. Baby romaine/herb salad mix, slivers of Granny Smith apple, goat cheese, and candied pecans. Update 11/4/10: I made this dressing for dinner using a very ripe juicy Comice pear, so tender it didn’t need to be poached first. I just threw it in the mini-chopper with the rest of the ingredients, using white balsamic instead of rice wine vinegar and leaving out the sugar. It made an excellent simple salad with green lettuce, baby spinach and sliced French breakfast radishes from the community garden, plus a few extra pear slices and toasted pumpkinseeds.